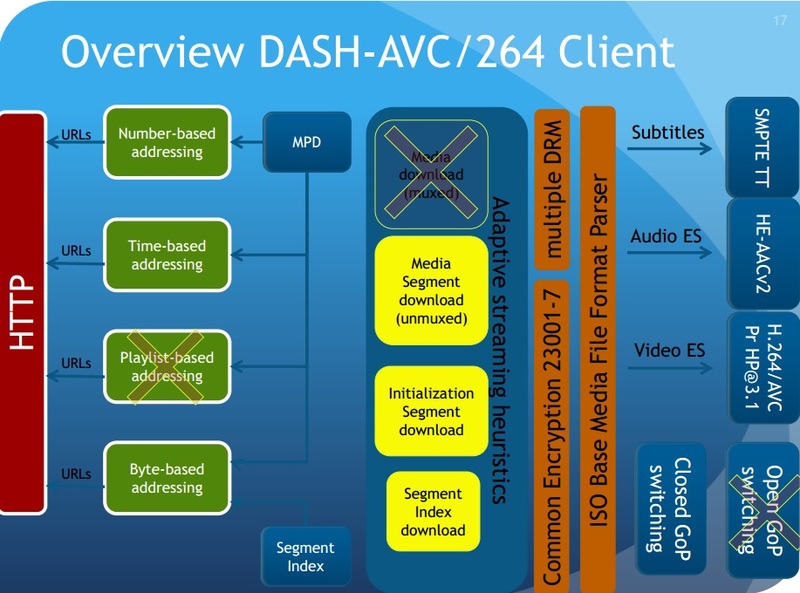 Thanks to a joint effort of GPAC Licensing, EBU and DASH-IF, the open-source multimedia framework GPAC now has support for the DASH Industry Forum DASH AVC/264 profile… and beyond! In this article we are going show you how to setup GPAC for your OnDemand and Live contents. In a next article, we’ll see how to use GPAC to encrypt your data with support with the most common DRMs. When the MPEG-DASH standard (latest version) was released, it was still a wide standard. A DASH Promoter Group has rapidly emerged to emit a set of good practices. The DASH Industry Forum was born and has yet emitted several documents. The most important papers here are the recommendations and interoperability points. If you don’t know yet about MPEG-DASH, I advise you this excellent article from Christian Timmerer. Click here for a state of the available products from Nicolas Weil. The DASH-IF forum also launched a community effort to build a web player for MPEG-DASH. It relies on HTML5 Media Extensions such as MSE (Media Source Extensions). Some other extensions or other projects may be used in the future like HTML5 EME for encryption (register to our mailing-list to know more about how it coordinates with DRMs), Mozilla Popcorn for the TTML subtitling support, or mp4box.js for ISOBMF demuxing. The player code is available on github. The first private beta was launched in March. The platform development have been mostly made by Hiro, a small design and development agency that provides web and mobile applications as well as custom media solutions. At IBC 2014, we are going to show more, including HEVC live, DASH-IF and DVB-DASH recommendations, and some TV support from LG and tablet support from Qualcomm. 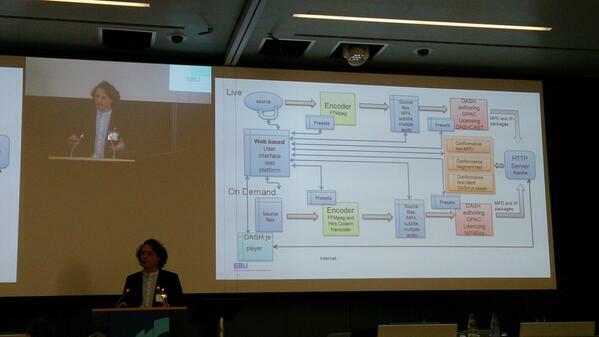 More information at https://tech.ebu.ch/news/ebu-ibc-2014-whats-happening-23jul14. This relies on MP4Box live capabilities. MP4Box can take an existing file and DASH it realtime until it is entirely processed using the “-dash-live” option. It can also process existing chucks and return immediately. In this case it relies on a context file to resume for the next data chuck. The option is called “-dash-ctx” and is ideal if your data is already segmented (HLS for example as we use it in EBU.io). Learn more. DashCast output is natively compatible with the DASH-IF profile. It is suitable for any MPEG-DASH application. The support against the dash.js player is maintained by the GPAC community. Please note that GPAC Licensing has a more modular version of DashCast with some professional support. Please contact us for more information. No checks on the Elementary Streams. You may provide some incorrect codecs of profiles without receiving any warning from MP4Box. “segment timeline” with multiple non-aligned representations is currently broken. Fixing this will require either time or some funding from a partner. We need to change the way we represent data in the GPAC DASH segmenter (which was made while DASH was just a draft, see this excellent MPEG-DASH timeline by Nicolas Weil). Feel free to propose your help. Read the GPAC CENC documentation. Subscribe to the GPAC Licensing mailing-list to have access to a video explaining how it works. Wait for a next blog article which will explain how to be compatible with Microsoft PlayReady, Adobe Access, maybe more. DASH-IF profiles specific, please use the DASH-IF Mailing-List. For dash.js matters, please use the dash.js google group. If you do or plan to have some professional support on GPAC, click here. For all the other requests, please use the GPAC public forums.